Gold was modestly higher overnight in a narrow range of $1335.05 - $1341.80, fading some minor movements in the US dollar. Gold traded up to its $1341.80 high as the DX dipped to 89.66 from continued strength in the pound ($1.4230 - $1.4296) and the euro ($1.2317 - $1.2340, stronger Eurozone trade balance). Later on and just before the NY open, however, the DX rebounded to 89.87, which drove the yellow metal back to the $1337 area. Mostly firmer global equities were a headwind for gold with the NIKKEI +0.6%, the SCI was off 0.7%, Eurozone markets were flat to +0.7%, and S&P futures were +0.2%. Firmer oil prices (WTI to $67.76, fresh 3-year high – Middle East tensions continue to be supportive) aided equities. Earnings from major US Banks announced around 8AM were mostly positive, lifting S&P futures (2677), and pushed the US 10-year yield to 2.841%. The DX ticked up to 89.89, and gold was pressed to $1335. Gold was also hurt by some hawkish comments from the Fed’s Rosengren (might have to tighten monetary policy by more than currently reflected in the median forecast for the federal funds rate, thinks the labor markets may tighten more that Fed officials think and that inflation is likely to run a little hotter). At 9 AM, some dovish comments by the Fed’s Bullard (recent inflation data “uninspiring”) helped US stocks open stronger (S&P +16 to 2680), and pushed the 10-year yield back to 2.834%. 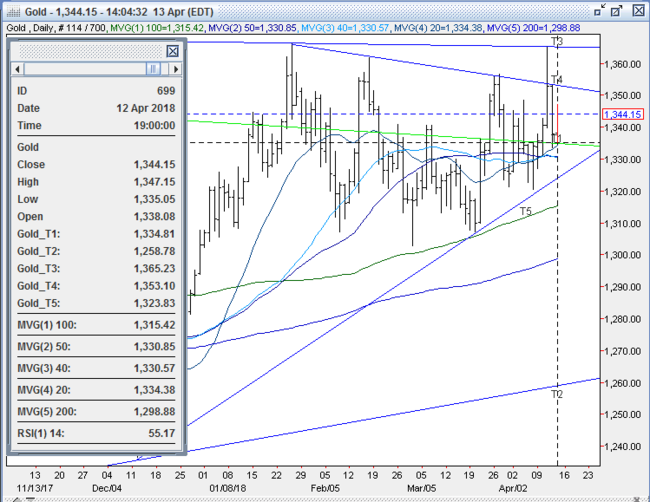 The DX pulled back to 89.77, and gold rebounded to the $1340 area. At 10 AM, a worse than expected reading on the University of Michigan Consumer Sentiment Index (97.8 vs. exp. 100.5) overcame a slightly better than expected report on JOLTS Job Openings (6052 vs. exp. 6024). US stocks, which were already coming off of their opening highs, fell further by late morning (S&P -13 to 2651, bank stocks roll over). The 10-year yield slipped to 2.817%, and the DX ticked down to 89..71. Gold took out resistance at the overnight high to reach $1347.15 by mid-day. Into the afternoon, US stocks recovered to near unchanged, while the 10-year yield ticked up to 2.825%. The DX bounced to 89.79, and gold slipped back to $1344. Open interest was off 17.8k contracts, showing a good chunk of long liquidation from yesterday’s sell-off. Volume was lower but still very robust with 421k contracts trading. All markets will continue to focus on the volatility in the equity and bond markets, geopolitical events, developments with the Trump Administration, corporate earnings, oil prices, and will turn to this afternoon’s Commitment of Traders Report followed by Monday’s reports on US Retail Sales, Business Inventories, NAHB Housing Market Index, and comments from the Fed’s Bostic for near-term direction.